The synchronicity of life's full-circle moments should never be taken lightly. 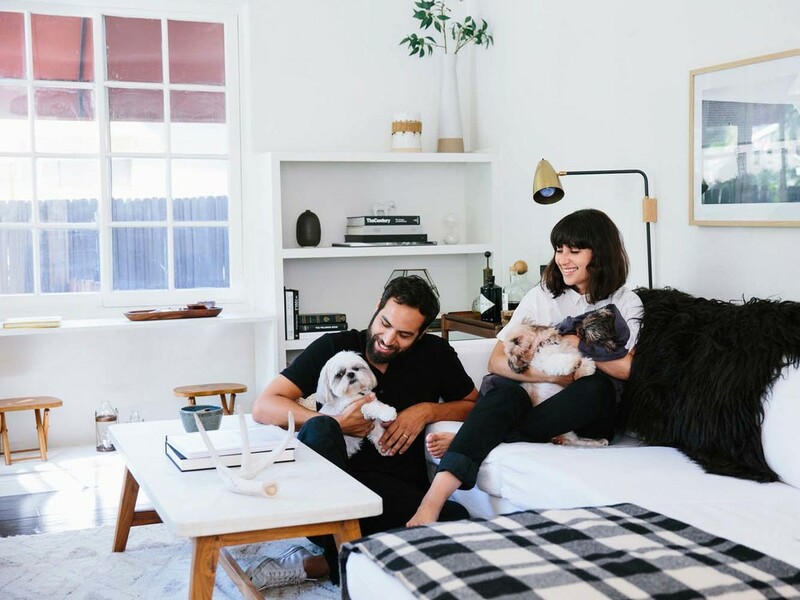 It's in the power of those moments - when seemingly random pieces of your life story join together like interlocking puzzle pieces and suddenly illuminate a picture you didn't realize was there - that you often uncover some key truths about yourself. These epiphanies either confirm a hypothesis that your subconscious was testing out, or reveal the true meaning behind something in your past. For me, both of these things happened on August 21st, when the pictures in this post were taken. 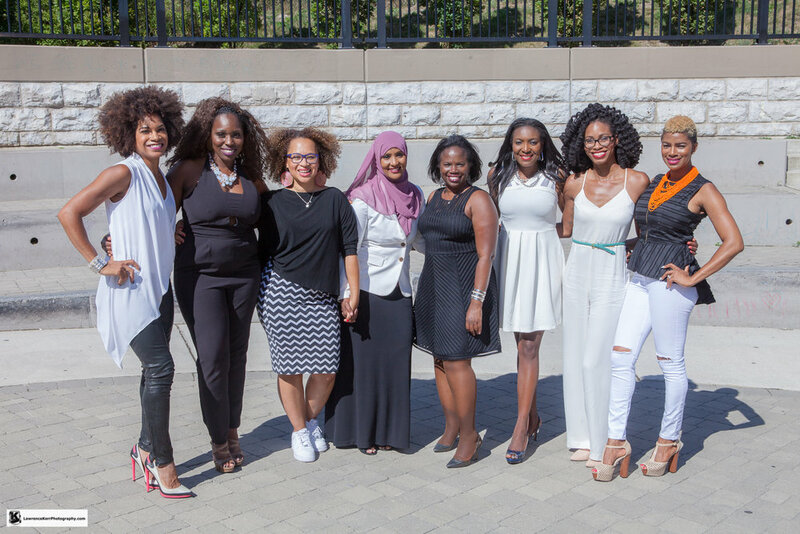 Earlier this month (on the 5th anniversary of my 1st blog post on '83 To Infinity, no less), I got a call inviting me to participate in a photo shoot being arranged to showcase Black women in Canadian media. 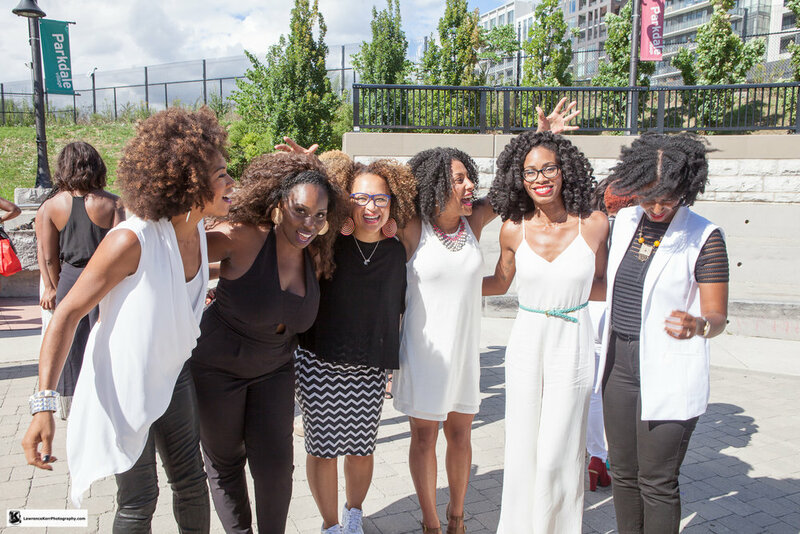 Inspired by an earlier impromptu photo of some of Canada's dopest Black women in the industry, this upcoming shoot (by award-winning photographer Lawrence Kerr) was going to gather as many Black women in media as possible in one spot, and my presence was requested. Have you ever felt like you belonged somewhere, but in the same breath thought "WTF? I belong here???" Imposter Syndrome set ALL the way in, but I still got myself together that fateful Sunday and headed to the shoot. Surrounded by women I've looked up to, women whose work I've admired, women who have become friends, and women who I met in person for the first time, it was an afternoon filled with warmth, sisterhood, upliftment, and real #blackgirlmagic. 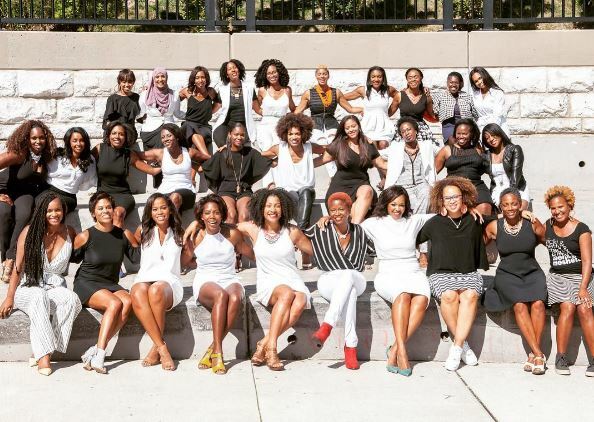 It goes without saying how important it is to see a number of multi-hued Black women who are all doing work in various areas of journalism and media. For narratives to change and become more authentic, Black women need to be show hosts, journalists, producers, writers, creators, media entrepreneurs, and so much more. Unlike our U.S. sistren, we don't have access to the same kinds of media outlets - mainstream or otherwise - that serve to celebrate, entertain, and inform. We're forging our way in the Canadian industry, taking our rightful seats at tables and building tables of our own to do important work that we're passionate about. A number of amazing women were there in spirit only (would have loved to thank women like Traci Melchor, Rosey Edeh, and so many others - next time!) but I was so honoured to share space with the women who were able to be present. 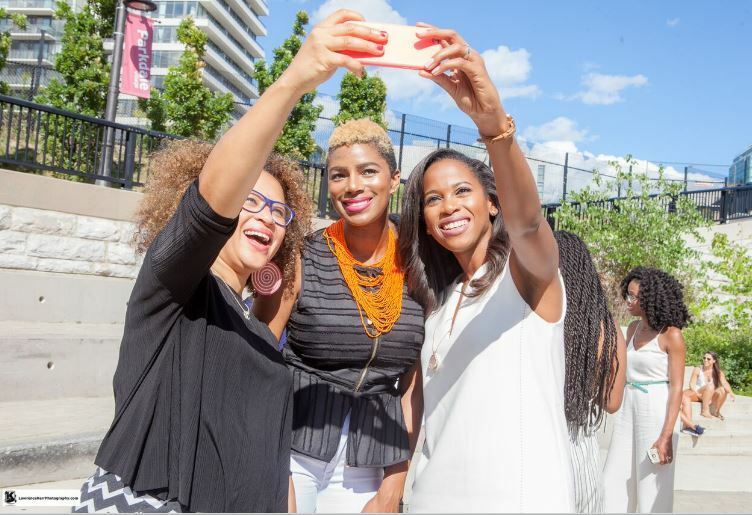 Do you see Arisa Cox, host of Big Brother Canada, in white in the centre of the 2nd row? She inspired my first ever solo event, Mirror Images - talking about diversity and representation from the perspectives of Black Canadian women in media. She wrote an incredible article that made me tweet "I wish someone would host an event with Arisa and other Black women talking about their experiences" - then I did it. Arisa - who lived in an entirely different province - made sure to be in attendance and provided mentorship for me and everyone who came. Check the woman sitting 3rd from the left in the front row. TVO host Nam Kiwanuka is a woman I've admired for YEARS, and she was one of the first Black women I saw regularly on Canadian TV. I was so nervous inviting her to be on my Mirror Images panel, and literally did a happy dance when she accepted - and now, we've become friends who cheer for each other at every turn. Reporter/Anchor Nneka Elliot (3rd from the right in the first row) used to hold events called The Media Huddle where I really started to get my feet wet in learning about the media industry. She's since been a major supporter of me and the projects I work on, and is an inspiration to many. 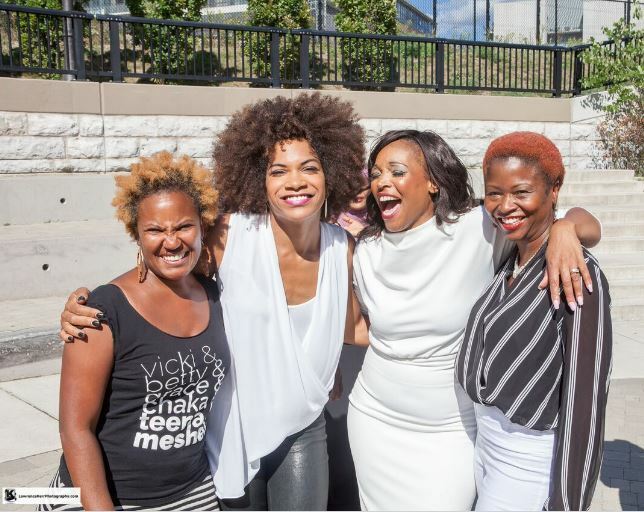 Tracy Moore (beside Nam in the white) and Marci Ien (beside Nneka in the black) are media powerhouses who have both given me kind and encouraging words. Producers like Kathleen Newman-Bremang and Nicole Brewster-Mercury are behind the scenes, intentionally and determinedly crafting what we see on TV. Hodan Nayaleh and Patricia Bebia-Mawa have built platforms like Integration TV and AfroGlobal TV respectively, to create space for ethnocultural stories in media. That woman sitting front row centre? That's the inimitable Camille Dundas - TV producer, digital magazine editor, and media mentor extraordinaire, who pulled this whole thing together. And do you see CTV reporter Andria Case in front in the fly yellow heels? A major piece of what led me to that photoshoot started with her. She interviewed me back when I modeled in Toronto Fashion Week, shortly after I started this blog. I used my married last name, Quammie, in the interview - and that was the catalyst to a strange coworker googling my name, finding my blog, and reporting me as a racist at work. I nearly stopped blogging after that, but didn't. I never got to thank Andria at the shoot for unknowingly being part of one of the most important moments in my journey, but thank you. When I left the shoot, I thought about the day I contemplated not blogging anymore, then thought about how far I've come since then. In that moment I realized I needed to stop being passive about my journey through blogging, writing, and media. As much as I've played it humble and looked at myself as someone who was merely paying their dues, I've been putting in work - and I'm ready to own that. I'm ready to put in even more hard work and continue to carve out my space in the media world, whatever that may look like. Being included among these incredible women reminded me not to take my journey for granted and not to take my skills lightly. As I walked back to my car on that exceptionally sunny Sunday, I realized I was meant to be there that day and thought, "The future has never looked so bright." Here's to lifting each other as we climb, celebrating the ones who came before us, and looking out for the ones who are on their way. #CanadianMediaSisterhood is real.